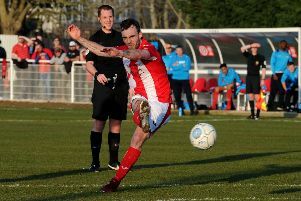 Nuneaton’s clinical finishing left Brackley Town empty-handed in Saturday’s 3-2 Vanarama National League North defeat on another frustrating afternoon at St James Park. Two excellent second half finishes by Elliott Whitehouse edged the game for the visitors when once again Saints’ performance deserved better. The home side were ahead within the second minute as Matt Lowe side-footed his shot into the top corner with great composure. But the lead did not last long as Saints were pegged back in the 12th minute through captain Shane Byrne’s deflected shot after a period of real pressure on Sam Hornby’s goal. Both sides had chances before the interval; James Clifton shooting wide when through on goal perhaps the closest. Saints started the second period strongly but could not capitalise on three good chances before Nuneaton went ahead in the 52nd minute as Whitehouse powered a header downwards giving keeper Hornby no chance before the hour mark. Fine play by David Moyo in the 62nd minute saw defender David Morgan’s clearance cannon off Richard Batchelor and into the net to bring the sides level once more. Saints again had chances but it a great 75th minute shot by Whitehouse that put Nuneaton back in front. Lowe shot inches wide and Steve Diggin’s header was off target and this time Saints could not find a way back despite the lively introduction of new signings Lee Ndlovu and Courtney Cameron from the bench.